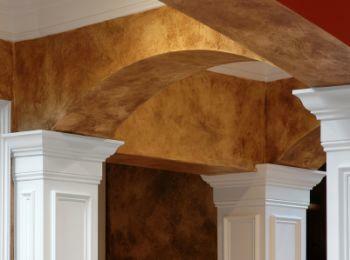 Faux painting a room adds dynamic texture and color to any space. Whether you choose to faux paint the entire room, or just some small sections as accents, faux painting can be simple and easy to do with the right technique. 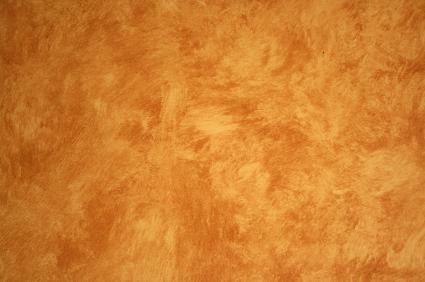 There are nearly countless types of faux finishes you can achieve with paint, glaze, brushes, rags and sponges. Many of the different techniques involve the same materials used in a variety of different ways to get the look you want. When you begin faux painting, take the time to try out the different techniques on a piece of tag board or plywood first. This will help you perfect your technique, and also let you experiment with applying the paint using a variety of different tools. Color washing is one of the most basic methods for faux painting, but also one of the most effective. It can be done on its own, or you can go back into the wet glaze with a variety of different rags and brushes to create other looks. Color washing can also be the base for faux marble, if you go back in with a veining brush and a third color once the paint is dry. For the best results, choose two colors of paint that are on opposite ends of the same paint strip to give you depth without too much contrast. Mix together equal parts baking soda and vinegar to form a fizzing mixture. Use this mixture to scrub down the wall or walls you plan on faux painting with a kitchen sponge. Rinse the walls with water and allow to dry completely. If the walls have any cracks or holes, take the time to patch them before you paint. Tape off the edges of the walls with painter's tape. Press the edges of the tape down firmly to ensure you get clean lines. Roll a coat of the darker, brighter colored paint onto the walls. If the color is very dark or bold, plan on giving the walls at least two coats of the base color. Allow the base color to dry for at least four hours before applying the top coat. Mix together one part of the lighter-colored paint with five parts of the liquid glaze. Stir well to combine. Dip a soft cloth or rag into the top coat and wipe it onto the walls. Experiment with using different strokes or techniques for applying the glaze; once you settle on a technique, use it over the entire surface to create an even result. 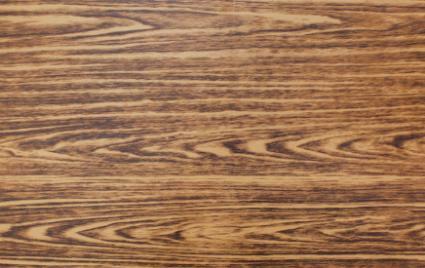 Wood-graining is a technique that adds texture and the appearance of stained wood to walls, floors or furniture. Like the color washing technique, it uses two shades to get the look, but it applies them in a very different way. Clean the area you plan to apply the paint to with a mixture of baking soda and vinegar. Rinse well with water and allow to dry completely. Roll on a coat of the light-colored satin latex paint. Allow the paint to dry for a minimum of four hours. Dip a brush into the gel stain and apply a single stroke running the length of the wall or floor. Place the wood-graining rocker against the stain at one end of the brush stroke and begin pulling it through the stain in the same direction as the brush stroke. Rock the tool back and forth gently in the stain every few inches to vary the pattern of the wood grain and give it an authentic look. Wipe the excess gel stain off the rocker with a rag when you reach the end of the first row. Apply a brushstroke of gel stain next to the first and drag the notched edge of the rocker through it to vary the grain. Repeat, using the notched edge every two or three rows. Faux painting even a small section of a wall in your home can be a fantastic way to add some depth and dimension to the area. Try these basic faux painting techniques and see what kind of texture it brings to your room.